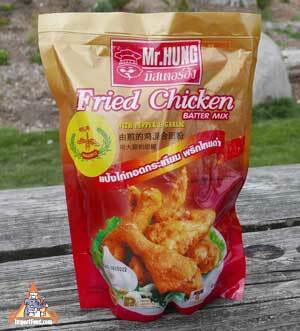 Leave it to the Thais to create the best fried chicken in the world. This batter perfectly coats your chicken (or vegetables, as we made fried mushrooms and onions that turned out excellent). Simply mix this with water and sugar (see mix below). You really can't go wrong, and it's just excellent batter. We fried drumsticks and breast slices, then used world-famous Thai sweet chile sauce as a dip. 17.5 oz is a nice large package so you can make several big batches. We also use this batter to make Hoi Tod, and see recipe below for Tom Yum Fried Chicken. Ingredients: wheat flour, rice flour, corn starch, baking powder, garlic powder, black pepper powder, msg. Packed by Mr Hung. Mix 1.5 cups fried chicken batter with 3/4 cup water, then add 2 teaspoons sugar. Put an inch or so of vegetable oil in a frying pan and heat at medium-high. Fry chicken or vegetables until golden brown, then flip and cook the other side. For chicken, cooking time is about 15 minutes total. Less for vegetables. See our recipe and detailed instructions. This is a marvelous Thai fried pork thanks to the marinade and special flour, and the pork is perfect paired with Thai pineapple chilli sauce. You might be also interested in our recipe for Thai-Style Fried Chicken. Moo = Pork. Kratiem = Garlic. Chup = Dip. Paeng = Flour. Tod = Fried. So this is Garlic Pork Flour-Dipped and Fried. Our Thai batter mix perfectly coats your pork. Our recipe is easy to follow and doesn't take long to make.